Sky’s The Zone will resurrect its cheesy Cinema Z slot in February with four premieres, including the sequel to last year’s Lavalantula. Quipped Fangoria: “Much like its predecessor, 2Lava 2Lantula feels like an 80-minute Funny-or-Die sketch mocking Sharknado, with all groaners, all the time. 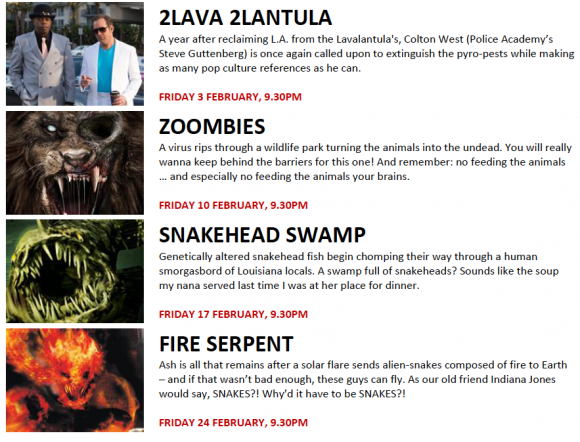 2Lava 2Lantula will air February 3, ahead of Zoombies (February 10), Snakehead Swamp (February 17) and Fire Serpent (February 24). They will be double-billed with re-runs of Avengers Grimm, Abraham Lincoln vs Zombies, Frankenfish and Fire Twister. Other highlights in February will include the season two premiere of The Expanse (8.30 Wednesdays from February 13) and the launch of the final season of Teen Wolf (8.30 Fridays from February 24). New next month will be seasons two of The Magicians (8.30 Tuesdays from January 21) and three of The Librarians (8.30 Mondays from January 30) while getting a post-SoHo run will be Outcast (9.30 Tuesdays from January 31). The Zone will also pick up the UK Robot Wars from season five (7.30 weeknights from January 16) and will strip classic episodes of Doctor Who 7.00 weeknights from January 9. 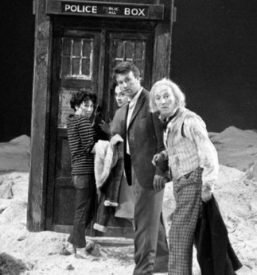 They will open with 1963’s An Unearthly Child, starring William Hartnell, and continue through to Sylvester McCoy’s run as the seventh Doctor in the late ’80s.